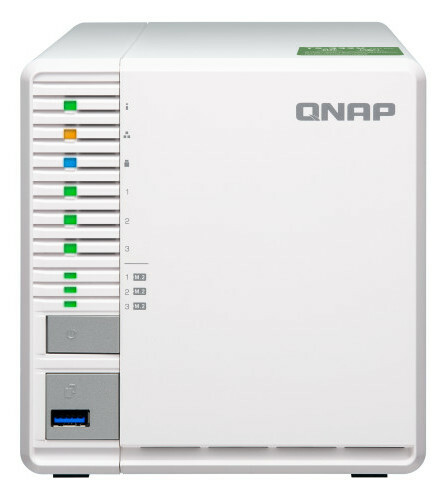 QNAP Systems, has earlier this month released a new quad-core 3-bay NAS – the TS-332X – that allows for building a RAID 5 array for balancing capacity and protection with the fewest disks. The TS-332X also provides a 10GbE SFP+ port, three M.2 SATA 6Gb/s SSD slots, and supports SSD caching and Qtier auto-tiering technology to help tackle performance-demanding business operations. 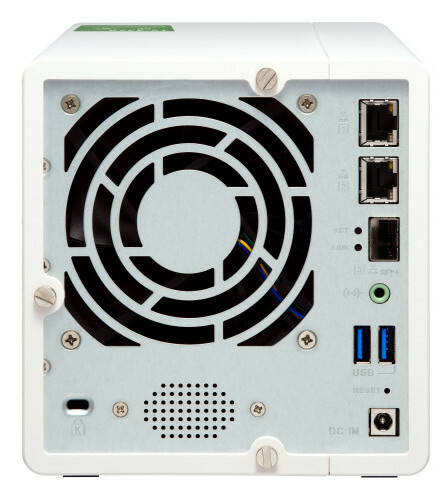 Featuring a minimalist design, the affordable 10GbE-ready TS-332X can easily fit any commercial space. The TS-332X uses an AnnapurnaLabs, an Amazon company Alpine AL-324 quad-core 1.7 GHz Cortex-A57 processor, features 2GB/4GB DDR4 RAM (upgradable to 16GB), and comes with a 10GbE SFP+ port to provide compatibility with high-speed networks to empower large-data applications, fast backup/restoration, and containerized applications. The TS-332X sports a stylish and elegant look with an industrial design concept to provide effective airflow and cooling, and its tool-less 3.5-inch hard drive installation allows easier system setup and maintenance. The TS-332X supports up to three SATA 6Gb/s M.2 SSDs with 2280 form factors (sold separately), allowing users to create a high-capacity SSD cache for boosting IOPS-demanding applications, or RAID 5 tiered storage with balanced performance and redundancy protection. Coupled with QNAP’s Qtier technology that empowers the NAS with auto tiering, storage efficiency is optimized constantly across M.2 SSDs, 2.5-inch SSDs, and high-capacity HDDs with improved overall system performance. The TS-332X runs the intelligent QTS operation system that simplifies NAS management with greater flexibility and efficiency. Block-based snapshots enable comprehensive data protection and instant restoration, providing a modern way for users to effectively mitigate the threat of ransomware. As an all-in-one NAS solution for file storage, backup, sharing, synchronization and centralized management, the TS-332X is a productivity boost for daily tasks. Users can install various apps from the App Center to extend NAS functionalities, such as Container Station for LXC and Docker containerized applications, QmailAgent to centralize email account management, and QVR Pro to create a professional video surveillance system (with 8 free IP camera channels, and expandable up to 16 channels with optional licenses). With VJBOD (Virtual JBOD), the unused storage capacity of the new TS-332X can be mounted using iSCSI as a virtual disk of other QNAP NAS. 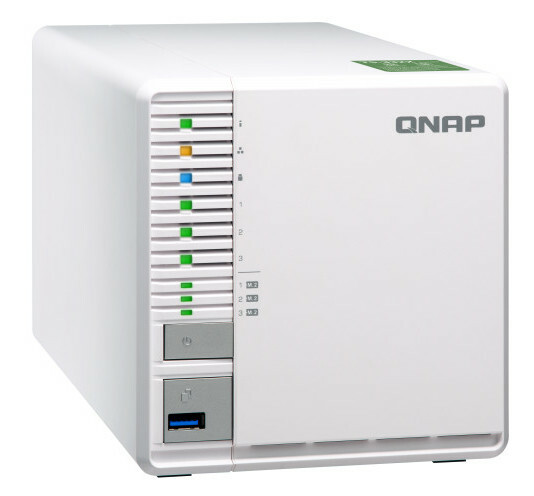 It is a great benefit for organizations with multiple QNAP NAS and helps achieve optimal capacity utilization in a cost-effective way. 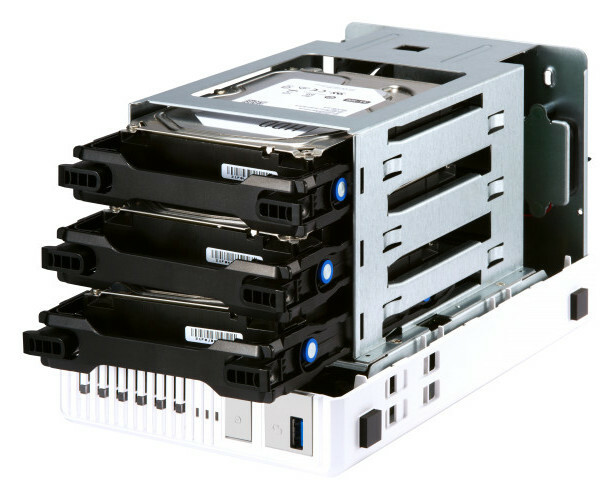 3-bay tower model; AnnapurnaLabs, an Amazon company Alpine AL-324 quad-core 1.7 GHz Cortex-A57 processor, 64-bit; hot-swappable 2.5/3.5-inch SATA 6 Gbps HDD/SSD; 3x M.2 2280 SATA 6Gbps SSD slots; 1x 10GbE SFP+ LAN port; 2x Gigabit RJ45 LAN ports; 3x USB 3.0 ports; 1x 3.5mm line-out audio jack; built-in speaker.